The jumper consists of four pieces, the back and the front are the same as are both of the sleeves. This kind of neckline is often called a boat neck and is straight rib with a little shaping for the shoulders. 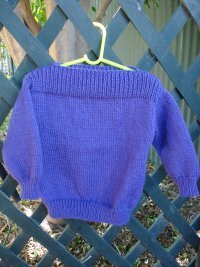 The style of neck on this simple childs 8-ply jumper is particular good for small children as the opening at the neck is quite wide making it easy to get the jumper on and off over their heads. The jumper in the picture is a size two and was knitted using Carnival 8 ply pure wool. The actual garment is more purple than blue as it appears in the photo! 1 pair each 4.00mm (UK 8, US 6) and 3.25mm (UK 10, US 3) or sizes needed to give correct tension. Knitters Needle for sewing seams. 22 sts to 10 cm width over stocking stitch. Using 3.25mm Needles, cast on 69 (77 – 83 - 91 – 97 – 103) sts. 1st row – K2, *P1, K1, rep from * to last st, K1. 2nd row – K1, *P1, K1, rep from * to end. Rep 1st and 2nd rows 6 (6 – 7 – 7 – 9 – 9) times… 14 (14 – 16 – 16 – 20 – 20) rows rib in total. Work in stocking stitch until work measures 23 (26 – 28 – 30 – 32 – 35) cm from beg, ending with a purl row. Tie a colored thread at each end of the last row to mark beg of armholes as there is no armhole shaping. Work a further 28 (32 – 34 – 40 – 42 – 46) rows stocking stitch. Work 10 (10 – 14 – 14 – 18 – 18) rows rib as before. Shape shoulders – Keeping rib correct, cast off 4 (5 – 6 – 7 – 8 – 8) sts at beg of next 4 rows, then 5 (6 – 6 – 7 – 7 – 9) sts at beg of foll 2 rows. Cast off rem 43 (45 – 47 – 49 – 51 – 53) sts loosely in rib. Using 3.25mm Needles, cast on 37 (39 – 41 – 43 – 45 – 47) sts. Work 13 (13 – 15 – 15 – 19 – 19) rows rib as for Back and Front. Next row – Rib 4 (4 – 2 – 4 – 2 – 0), * inc in next st, rib 3 (3 – 3 – 2 – 2 – 2), rep from * to last 4 (6 – 2 – 5 – 3 – 1) st/s, rib to end … 45 (47 – 51 – 55 – 59 – 63) sts. Work 4 rows in stocking stitch. 5th row – K2, “M1”, knit to last 2 sts, “m1”, K2. Cont in stocking stitch, inc (as before) at each end of foll 8th (8th – 10th – 8th – 6th – 6th) rows until there are 57 (55 – 67 – 77 – 69 – 81) sts. 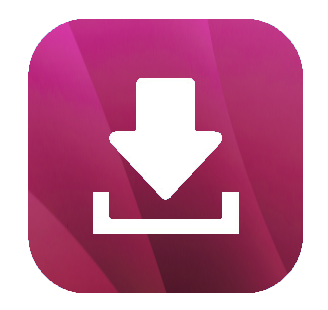 Sizes 4, 10 and 12 only – then in foll (10th – 8th – 8th) rows until there are (61 – 85 – 91) sts. All Sizes – Cont without shaping until work measures 23 (28 – 33 – 38 – 40 – 42) cm (or length desired) from beg, ending with a purl row. Cast off 5 (6 – 6 – 6 – 7 – 8) sts at beg of next 8 (8 – 8 – 10 – 10 – 10) rows. With a slightly damp cloth and warm iron, press lightly. Using back-stitch, join shoulder, sleeve and side seams to colored threads. Sew in sleeves. Press seams. Congratulations, you have now completed your Simple Childs 8-Ply Jumper! Just in case you would like to print out a copy of this Slipper pattern, I have created a pdf version of it that you can download. Are you looking for other ways to dress up your jumper? Here are just some of the ways you can alter this basic pattern to change the look of your jumper!